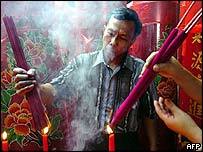 Indonesia's ethnic Chinese community forms a significant part of the nation's patchwork of races, ethnicities and tribes. But living in a country where nationalism often borders on xenophobia, their existence has been punctuated by a series of explosions of violence. Yet the ethnic Chinese community is starting to rediscover its confidence, beginning to take advantage of the democratic reforms that have swept through the country over the past seven years. In some ways the rise of China has been a vital part of this process. No-one is entirely sure how many ethnic Chinese there are in Indonesia. In a census held in 2000, respondents were asked to describe their ethnic background: less than 1% of the country s 210 million inhabitants described themselves as ethnic Chinese. Many sociologists regard this as a serious underestimate: they believe that somewhere between six million and seven million people of Chinese descent are now living in Indonesia. They say the reluctance to describe themselves as Chinese is a legacy of years of discrimination. Tens of thousands of ethnic Chinese died in the carnage that ripped through Indonesia in the wake of President Suharto's coming to power in 1965. The army, backed by civilian militias, went on the rampage, supposedly hunting communists. Many Chinese were killed, victims of a simplistic equation of their ethnicity with the politics of communist China. Suharto imposed the so-called New Order regime. For some prominent Chinese businessmen who were friends of Suharto, the New Order was a bonanza: they received huge government contracts and became some of the richest men in Asia. But for ordinary Chinese, the New Order was a disaster. 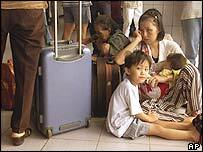 They were forced to adopt Indonesian names and carry identity documents that identified them as Chinese. They were discouraged from joining the all-powerful security forces and banned from celebrating holidays such as the Chinese New Year or using Chinese characters on their shops. 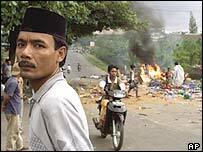 On May 14, 1998, as the Suharto regime limped to an ignominious end, riots erupted in areas of cities predominantly populated by ethnic Chinese. More than 1,200 people died, dozens of women were raped, and hundreds of shops were burned to the ground. "In May 1998, that was the first time in my life in this country that I felt insecure," says Richard Oh, a prominent businessman and author. "I looked around and thought that maybe I don't belong." But those riots marked the end of Suharto's so-called New Order regime, and Mr Oh thinks they were the final attempt by Suharto's most reactionary supporters to stir up trouble, rather than any expression of popular hatred of the Chinese. "It was a mistake committed by the dinosaurs, but a mistake that gave this country a chance at reformation," he says. The violence had a catalysing effect on the ethnic Chinese community. "1998 has shown that no-one is going to help them, and that they have to help themselves," says prominent sociologist Mely G Tan. "After 1998, they felt they really should assert themselves and show they are part of the nation." On 21 May 1998 Suharto was forced to resign, and shortly afterwards Indonesia held its first free elections in almost 50 years. In 2000, new president Abdurrahman Wahid announced that the Chinese could celebrate their New Year and use Chinese symbols on their shop signs. That pivotal change altered everything, says Mr Oh. The reforms have been followed by a renewal of confidence by many members of the ethnic Chinese community, but some people are still preaching caution. "I think they should be more prudent, especially those in the economy," says Dr Tan. She is still worried that the fissures exposed in the 1998 riots are still lying under the reformed polity, ready to emerge if too much strain is put on the relationship. For some, the reforms have not gone far enough. Frans Winarta, a lawyer and the founder of the Anti-Discrimination Movement in Indonesia, says many regulations promulgated by Suharto are still on the books. "These regulations can easily be repealed, but they have not been," he says. Limitations - both de jure and de facto - remain. Indonesian Chinese can now use their real names and celebrate New Year, but they are still unlikely to get a place at a state-run university, or join the army or police. Although it is no longer officially necessary, it can still cost between 3 million and 7 million rupiah for a person of Chinese descent to get the citizenship letter frequently demanded before they are allowed to go to school, get a passport or buy land. On a more personal level, marriages between the Indonesian Chinese community and indigenous Indonesians are still rare, with parents on both sides tending to discourage such relationships. But Richard Oh is confident that the long-term trend is towards integration. "The current atmosphere of harmony between the different races will I think bring us to a more multi-cultural and diverse mix in every segment of civil society, but it will happen slowly," he says. "I'm just as Indonesian as the next person."